Whenever I pick up a scary book nowadays, the cover is a tasteful affair. Lately, you could lay your horror fiction next to your mainstream beach books and have trouble telling the difference. Try it sometime at a bookstore and you’ll see. You could sneak horrifyingly graphic books onto a display of Oprah books and probably get away with it. The paperbacks of the 80s did not believe in this philosophy of blending in. 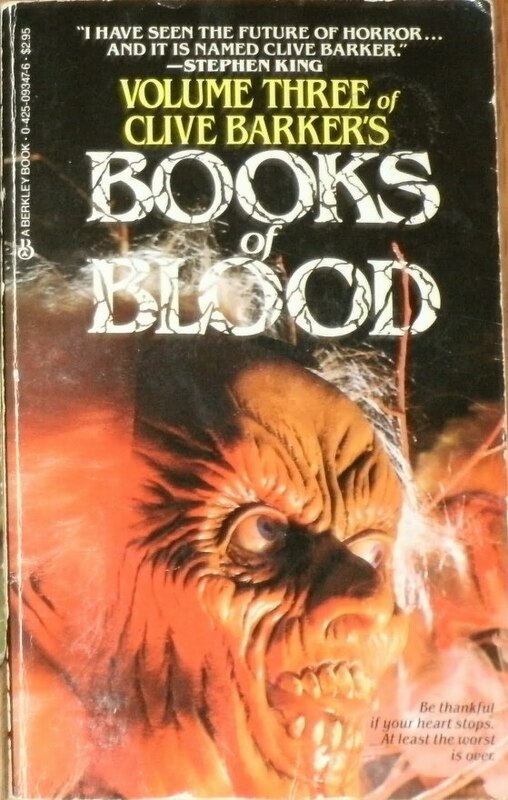 Every paperback horror cover in the 80s wanted to murder you senseless, and did everything it could to scream its intentions to you. Those books were shameless, shameless things. 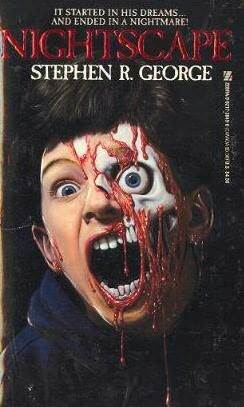 The best part is people would bring books with nasty covers anywhere in the 80s. Put one in your purse, leave it in the backseat of your car, or set it on the dinner table when your food comes. If you were an impressionable kid, you were never more than a glance away from seeing something that would bug your eyes out and make you hide behind a grown-up. I still get tiny goosebumps for the covers of books THAT I DIDN’T EVEN READ. One book of short stories had a Gothic horse-drawn hearse with snakes dangling off of it. My parents loaned that one to my older cousin to get it away from me before the nightmares came, and she still hasn’t returned it. One cover showed a blue-tinted house and a nervous man standing in front of it. It was judged too adult for me to read, but the cover did the trick. 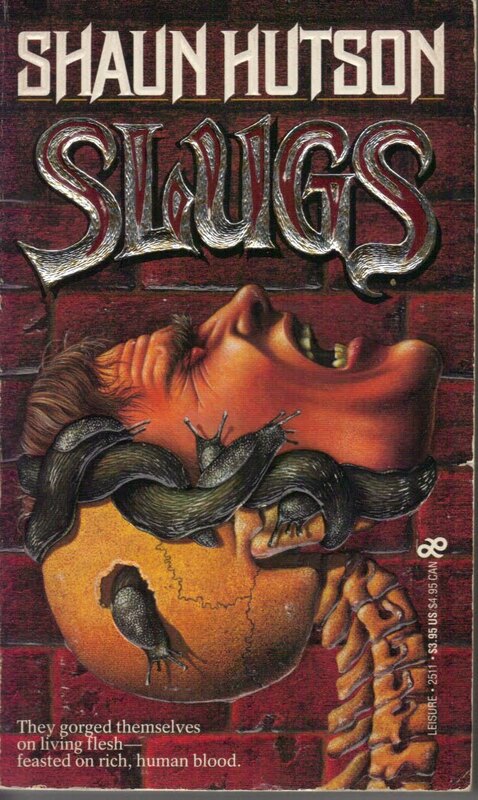 Hell, the covers of Clive Barker’s first books made me convinced me Barker probably murdered people daily. But don’t take my word for it. Check out Will Erickson’s blog Too Much Horror Fiction. Will’s been kind enough to help me pick some favorites to share and comment on. Will remembers seeing Tricycle at an early age and feeling the fear. The cover reminds me you can never see the faces of Minnesotan kids in the winter. 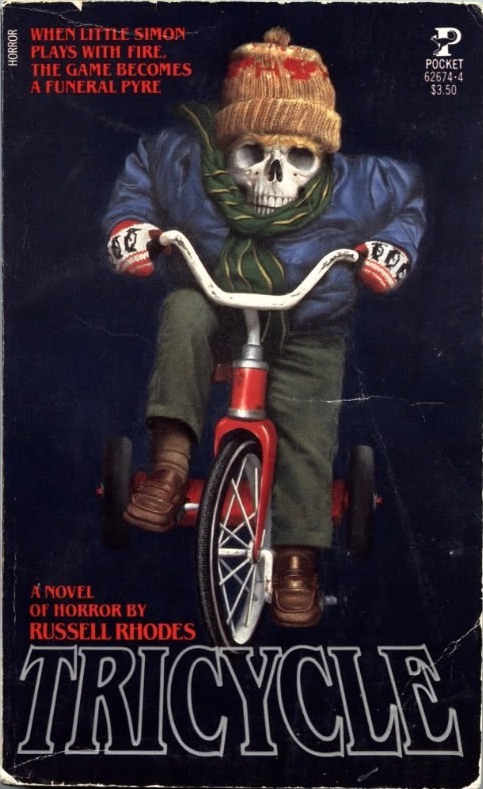 For all I know, there are a lot of these skeleton brats biking about. Be advised. Not a huge fan of slugs, leeches, and other slimy things in general. It seems reasonable they want to strip the flesh from my bones, leaving my face to screech helplessly into the night air. One INSIDE my skull, too? Why not? I can always use another reason to cringe when I visit a lake or pond. The main difference between this kid and a kid looking at this cover is one of them still has 100% of his face. Implication: Read this book and your face will melt. Then, some adult leaves you alone with this book and you start to get ideas . . . This is a lot of confusing, naked flesh. And it’s headed straight for me. Awesome. 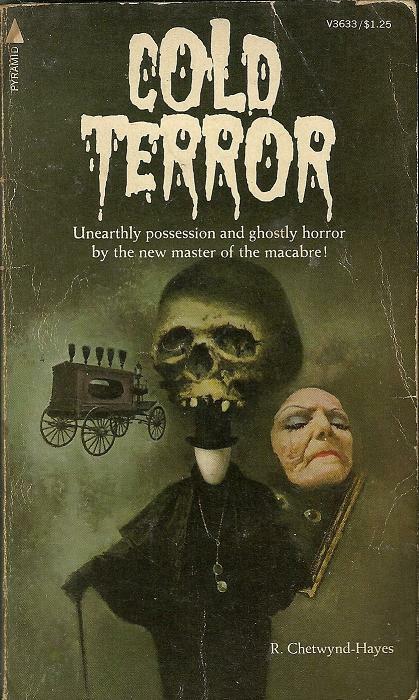 Severed old lady face disapproves, but death-headed carriage driver is a little harder to read. This book screams “Grown-Up Scares,” the kind they wait to discuss until after you’re in bed. You open the book, take a ride in the hearse, and you get an idea of what the adults are talking about. Except that big skull seems to hint there might be a price. Scary Stories in the Early Afternoon.